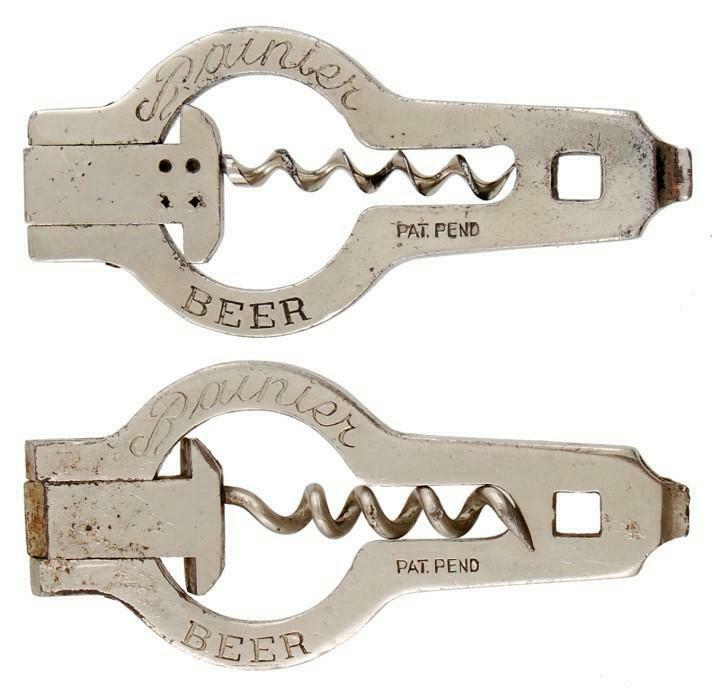 If you collect beer advertising openers or corkscrews, this is the web site you have been looking for. Through Just for Openers (JFO), you "open" new resources of information and access to other collectors. Continue reading for information on Club membership, Newsletters, the Annual Convention and Publications. Just for Openers was founded in 1979 by Don Bull of Wirtz, Virginia. Members in the United States and Canada mainly collect beer advertising openers and corkscrews, but may also collect soda advertising openers, wall mount openers, figural cast iron bottle openers, can openers, Cigar Box Openers (CBOs) and corkscrews from all over the world. NOTE: Many older bottle openers have a small square hole called a "Prest-O-Lite Key". from about 1910 through the early 1930's before electric headlights were widely used. Definition of the Term Church Key ??? How to Use The Handbook ??? JFO Membership: Membership (over 200 members) is free via this web site or if you wanted a printed copy (30 pages) of the newsletter mailed, you may pay $20 per year. Join today by filling out the membership card: JFO Membership Card, and sending the card in (for the printed newsletter also send a check payable to John Stanley), PO Box 51008, Durham, NC 27717. Your paid annual membership starts with the latest JFO Newsletter and go through the next full calendar year. JFO Newsletter: Each semiannual newsletter includes a designated feature plus many articles on openers (and/or corkscrews). The October/January newsletter includes New Discoveries and New Additions to the Handbook (see Publications below); the April/July issue includes the membership list (a wonderful resource) and the Annual JFO Convention highlights. All members are encouraged to send in articles and members are allowed a free ad in each issue. Annual JFO Convention: Members volunteer to host the annual convention held in April each year, so JFO members visit places all over the United States. Conventions are something you don't want to miss as you see openers and corkscrews you have never seen before and have a chance to add them to your collection. Members spend time in a central meeting/hospitality room, attend an auction and participate in the Saturday show (8-1) open to the public. Members and non-members are welcome. Details for this annual event are found in each newsletter. Members have their calendars marked for the 2018 JFO Convention in Seattle, Washington (April 18th-April 22nd). 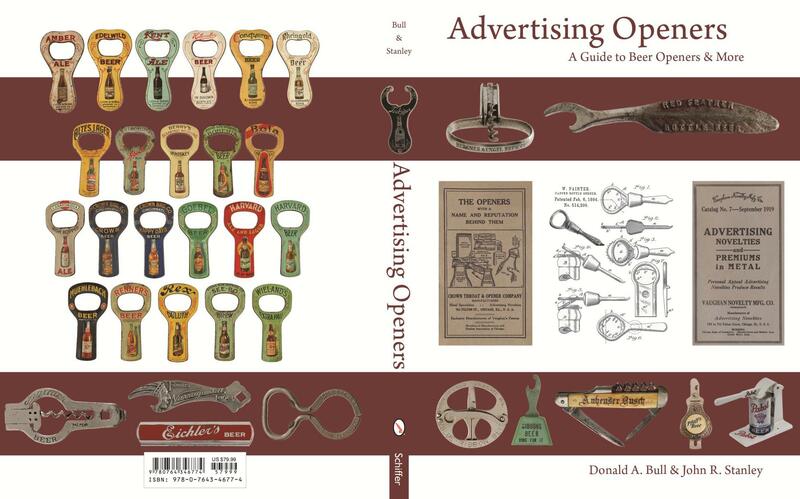 Advertising Openers: This valuable and expansive guide to advertising openers of all sorts features over 1,500 images picturing more than 2,800 openers and corkscrews. It is the ultimate guide to bottle openers. Whether you are interested in flat figural, key shape, wire formed, souvenir, and multipurpose openers or lifters, piercers, can keys, and smokers tools, you will find them here. Part 1 groups beer advertising openers and corkscrews in an alphanumeric system. Part 2 has special chapters on manufacturers� openers, beverage openers, can keys, smoker�s tools, souvenir openers, and World�s Fair openers. Patent drawings and details are included with many of the photo captions. Value ranges are shown. A chronological index of American patents and a type index in Part 3 also make this book an invaluable reference. May this publication �open� the minds of new and experienced collectors to the expanse of this unique and fascinating hobby. 288 pages. 9" x 12". Hard Cover. 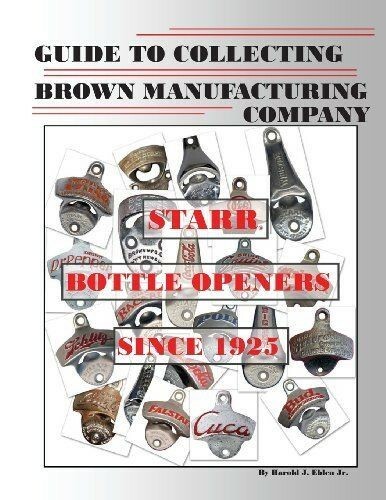 Starr Bottle Openers Since 1925 Guide To Collecting Brown Manufacturing Company: Brown Mfg. 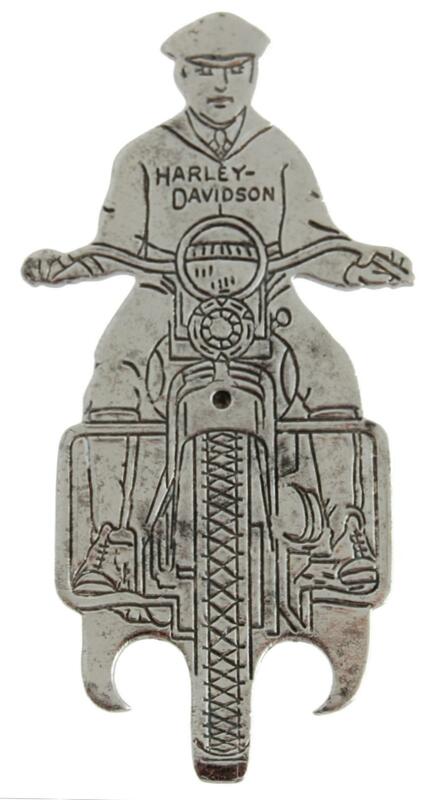 Company has been making the iconic stationary wall mounted bottle opener since 1925. This guide provides a complete inventory, with photographs, of known embossed bottle openers made by Brown and provides a way to approximately date their production. This will allow collectors to identify which openers could expand their collection. Also included is a brief history and rarity guide for each. Publications: Now eight books with color pictures are available, Advertising Openers; Starr Bottle Openers Since 1925; Boxes Full of Corkscrews; The Ultimate Corkscrew Book; Bull's Pocket Guide to Corkscrews; Just for Openers, A Guide to Beer, Soda & Other Openers; Soda Advertising Openers; and Beer Advertising: Knives, Letter Openers, Ice Picks, Cigar Cutters and More. Just For Openers A Guide to Beer, Soda & Other Openers: The softcover book by Donald A. Bull and John R. Stanley contains 160 pages and 380 color photographs that include over 850 openers and corkscrews. A price guide is included. Soda Advertising Openers: The softcover book by Donald A. Bull and John R. Stanley contains 160 pages and 275 color photographs that include over 300 openers and corkscrews. Over 2500 listings for the 300 types is included with prices. Beer Advertising: Knives, Letter Openers, Ice Picks, Cigar Cutters and More: The softcover book by Donald A. Bull contains 176 pages and 520 color photographs for sharp beer advertising items including prices. A Brewery/Brand index and a Manufacturers index are included for easy reference. For questions and suggestions: JFO-Email Thank you for visiting the JFO Homepage.